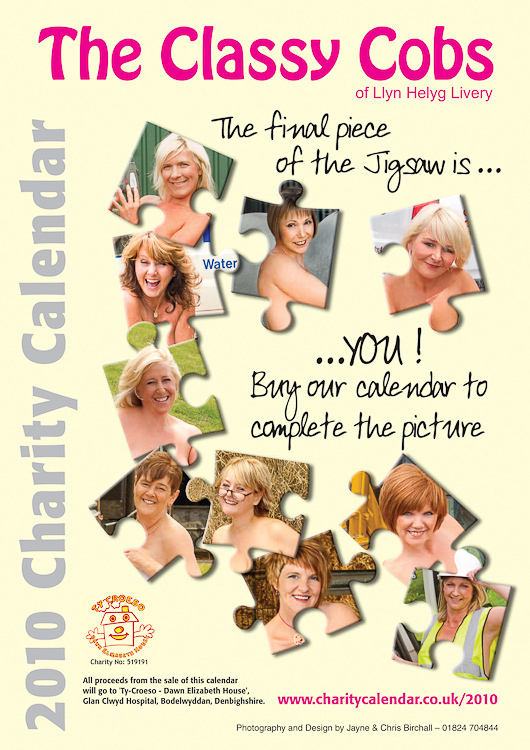 During 2010 Jayne and I were delighted to have produced the Classy Cobs Naked Charity Calendar which raised over £12,000 for charity. Ten lovely ladies from the Llyn Helyg Livery near Holywell got together to prove that cleaning out the stables and mucking about on the farm doesn’t have to be done in wellies and dowdy overalls. Jayne and I spent two weekends down on the farm shooting the pictures and as you can tell from their faces, great fun was had by all those involved. I designed the layout and produced the pages ready to be printed by Jeff Jones of A J Typesetters Ltd. A launch night was held at the Oriel House in St Asaph and all the girls did a fantastic job of Marketing and selling the calendar. All the funds raised went to the Ty-Croeso Dawn Elizabeth House – a totally donation-funded six bedroom house within the grounds of Ysbyty Glan Clwyd Hospital, near Rhyl, North Wales, to provide overnight accommodation for the parents of sick children on the paediatric wards. Visit the official Classy Cobs Web Site for more information and behind the scenes stories and pictures and here for the calendar facebook page. Dancer Sue strikes up a pose from Cabaret. At the moment, however, whilst her calendar page is gracing wall all over the world, Sue is contemplating the pose she will be striking in the maternity ward at the end of this month! Jason can be found roasting his chestnuts in the kitchens of Bar-W at the Wynnstay Arms in Ruthin. Check out the official calendar website. Catryn works for a company that helps people keep warm in the winter! is local arcitect Jan Bargiel. Cathryn chose this ‘power pose’ because her partner Ross (Mr April) is a live wire linesman. is Cheeky Photographer Neil Dallywater. Neil is photographer/editor for two of the country’s largest circulation tattoo magazines Skin Deep and Skin Shots.